Sibling Tag questions or brother/sister question tag are like the most amazing thing to do with your siblings. If you are the only child, you would totally get what I mean. However, if you are one of those lucky people that have a brother or sister, grab them and make them participate in the sibling question tag with you. Your sibling may have known you since your childhood, but it may surprise you how little or how much they know about you. It can also serve as just a way to relive some of your best memories together. Also, you can record a sibling tag video of you and your sibling answering these fun tag questions and post in on YouTube or any video platform. I have put together a comprehensive list of fun sibling tag questions you can answer with your brother or sister. 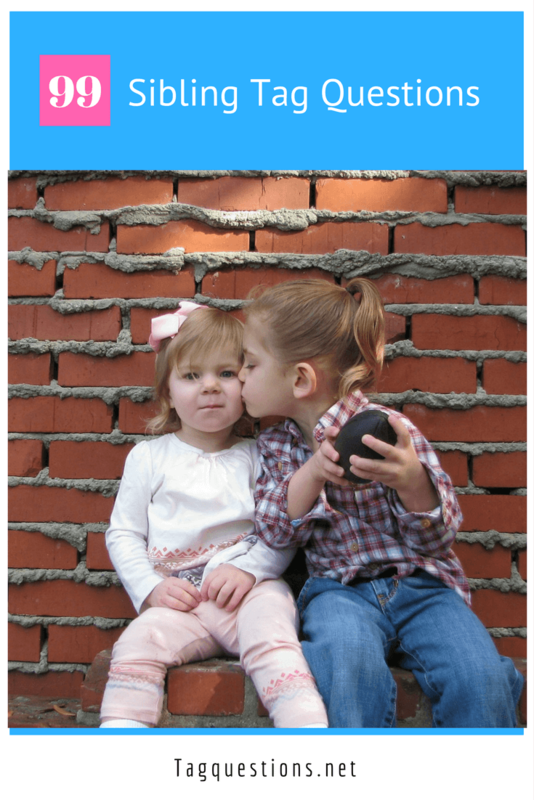 Here is a list of sibling tag questions to answer with your brother or sister. I hope you find them interesting! What is the age gap between you? If you were born first, what was your reaction to your new sibling(s)? Did you get along as children? What is the funniest memory that involves your sibling? What is your most memorable argument? What was the last text you sent to your sibling? What is your least favorite thing about your sibling? Describe your sibling in three words or less? Can you remember your sibling’s greatest achievement? Would you say that you are competitive towards each other? What are things are you both good at? What are things are you both bad at? Have you ever stolen anything from each other, if so then what was it? Do you share a lot with each other? Do you get along with your sibling’s friends? Have you ever had a crush on one of your sibling’s friend? What is one thing your sibling can do, that you can’t do? Who always had the messiest room? Which one of you got in trouble the most as kids? What is your favorite game to play together? What was your sibling’s favorite food as a child? What is your sibling’s favorite food now? What was your sibling’s favorite drink as a child? What is your sibling’s favorite drink now? Who was your sibling’s first crush/boyfriend or girlfriend? Is your sibling currently seeing anyone? If your sibling could, what’s one movie that they would watch forever? Who is more concerned with their appearance? Who is more likely to date someone based on their appearance? What is one physical trait your sibling has that you wished you had? What is one personality trait that your sibling has that you wished you had? Which one of you is closest to your parents? Which is one you is a Daddy’s boy/girl? Which one of your is a Mommy’s boy/girl? Which one of you is most likely to turn out like your dad/mom? Who is the most athletic? Who is the most money-conscious sibling? If you got called that your sibling was in jail, what would be the first crime that comes to mind? Which sibling would you call if you needed to be bailed out of jail? Who is most likely to work a normal 9-5 job in an office? Who is most likely to knock up a girl or get knocked up? Which one of you would get married first? If you had children which one of your siblings would you trust to look after them? What is one thing that has changed about your sibling as they have grown older? What would you guess is your siblings dream job? Which sibling is most likely to move far away from home? If you move away from your sibling(s) what will you miss most? Is your sibling more likely to move away for work or love? What is one thing your sibling doesn’t know that you got away with as a child? What is one thing your sibling probably doesn’t know about you? Have you conspired to keep any secrets from your parents, if so then what were they? If someone put a gun to your sibling’s head and asked them to sing a song without missing a word, what song would your sibling sing? If your brother/sister was a dog, what breed would they be? If your sibling was a country, what country would it be? What is your sibling’s shoe size? What’s your sibling’s favorite sports team? If your sibling’s life was a movie, which actor/actress will play their role? Biggest lie you sibling ever told your parents? Most likely to get into an Ivy League school? Best at keeping a secret? Which of you is the funniest? Which of you is the laziest? Most likely to join the Army? Most likely to run for office? Most likely to be captured by a terrorist group? Most likely to become the Pope? Most likely to be a celebrity? Most likely to fart in an elevator? If you run a YouTube page and you need ideas on how to delight your subscribers, you can play the sibling tag with your brother/sister on your channel. Now, it is your turn to take the brother tag questions or sister tag questions, depending on who’s reading.